Colorectal cancer (CRC) is the fourth cause of cancer deaths. More than one-third of colon cancers are stage III at presentation; their 5-year relative survival is 69 %. Among the high-incidence cancers, CRC has the highest median age at presentation. 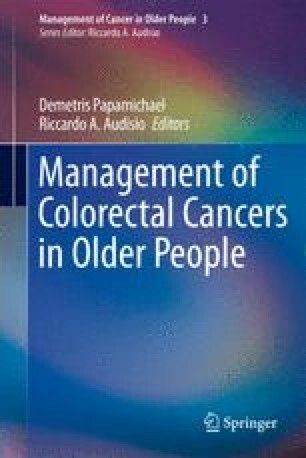 Thus, the administration of adjuvant therapy after curative surgery for elderly patients remains a burning question in daily practice. In the adjuvant setting, while there is an advantage in relapse-free survival with adjuvant therapy, there is no evidence-based survival benefit for adjuvant therapy due to confounding non-cancer-related deaths. However, with an optimal and careful management of relapses or second cancers, a survival benefit with adjuvant therapy is possible in some elderly patients. The use of a comprehensive geriatric assessment is strongly recommended to evaluate chemotherapy appropriateness. Elderly patients with good physical condition are able to receive combination therapy in a similar fashion to younger patients. American Cancer Society. Cancer facts and figures 2012. http://seehttp://www.cancer.org/acs/groups/content/@epidemiologysurveilance/documents/document/acspc-029771.pdf. http://www.cancer.org/acs/groups/content/@epidemiologysurveilance/documents/document/acspc-031941.pdf. Accessed on December 4, 2012.
http://data.un.org/Data.aspx?d=GenderStat&f=inID%3A36. Accessed on December 4, 2012.